I've been thinking about my car lately. First, I took it to get its oil changed, which was long overdue. Then, I washed it, inside and out, and it is now sparkling! Then, I took it on a mini road trip. Well, I took it on a road trip to the airport! I thought I would share the story of my car to you all! Back in high school, my parents made a deal with me. Get a 100 percent scholarship to a college, and, since they wouldn't have to pay tuition, they would buy me a car. The biggest hurdle would be accomplishing that SAT score. Bleh. That summer, my parents took me car shopping. We didn't really know what we were looking for, but we wanted something super safe, and something that would last a while and transition with me into being a grown up. Also, we looked for a car that I could tote kids around in! Ha! Not many 16 years olds include that in their car check list! Have I mentioned how lucky I am that my parents were able and willing to provide their teenage daughter with a car? Because I am. Very VERY lucky. And blessed. Within 2-3 hours, we found it! 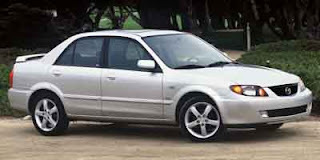 A 2003 Mazda Protege! Except mine is dark green. Oh how I love that little car! And it has loved me back, let me tell you! I have never had anything really go wrong with it (minus a battery about three years in, and a window mechanism this year,) and has been super easy to take care of! Wouldn't want it to suddenly burst into flames after all! *Correction. I wrote this post about two days ago, but on my drive to the airport, I was reminded of one "minor," error with my little zoom zoom. Right. SO, my car got a new door, and some other parts, but what we didn't realize was that in the shake up of the accident, my radio/cd player was damaged and should have been replaced. Only, we realized that AFTER the insurance paid for everything else to be fixed! So now, I have a hysterical clock radio/ CD player. The buttons don't do what they say they are going to do. You have to "try" different buttons to, say, skip a song. And then, darn it, it just ejected my CD! And then you have to start all over again. Sometimes I give it a good ol' slam with my hand, and, like magic, it works again. The best though, is definitely the clock. It often freezes on one time, and I will be driving, thinking to myself "Wow, 1:55, I have made GREAT time! Maybe I won't be late!" and then it dawns on me about my little clock problem, and I slam my hand, and.... 2:05!!!! My friend Katie loves "slamming," my clock. It actually is very fulfilling. I promise! Your car is cute...my dad had a Mazda Protege (a lot older than yours!) when my sister and I were little and we loved it. Unfortunately I totaled it while I had my drivers permit! lol oops. Luckily the accident wasn't my fault, I didn't get sited and my dad forgave me pretty easily, but he missed his little Mazda!